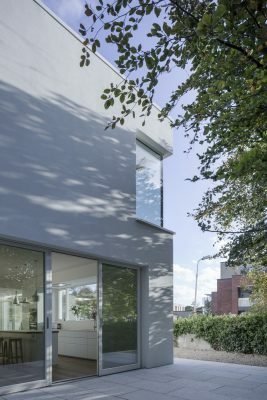 Constructed in the side garden of the Client’s redbrick childhood home, at the entrance to a typical suburban cul de-sac, the site was previously occupied by the family’s garage and boat shed. 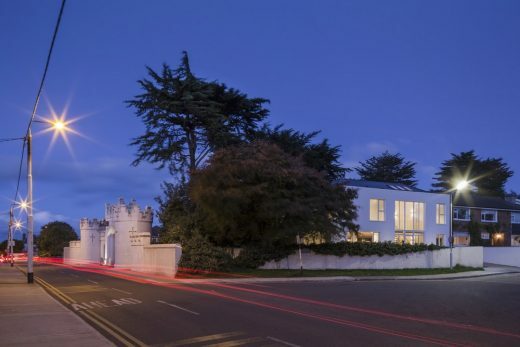 Defined by the imposing 19th century castellated gates to the neighboring school, the design carefully carves a space for a new residential dwelling, nestling itself respectfully beside its prominent neighbor while also drawing on the wider context of the bright seaside villas in the surrounding area. 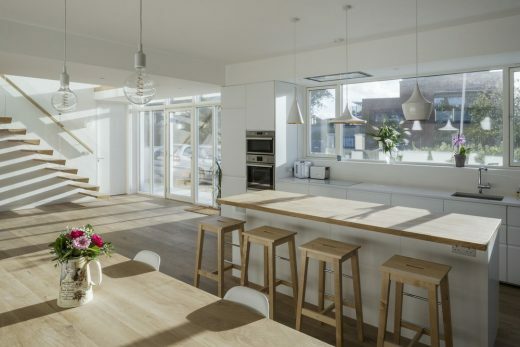 The Client’s were drawn to the sense of optimism and escape that comes with a seaside villa and sought to create a light-filled energy efficient home suitable for a young family that was in-line with their modest budget. 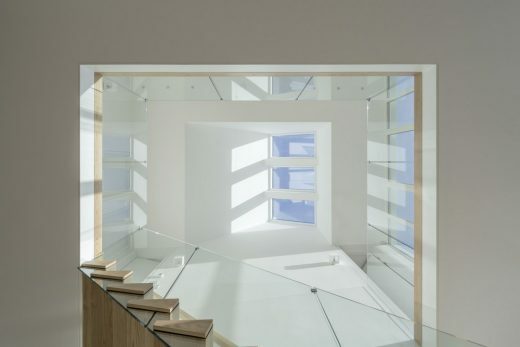 On approaching the building, a tall south-facing glazed atrium draws you into a grand double-height library space with a pitched oculus opening up views to the sky above. 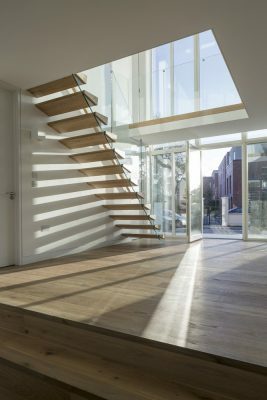 The cantilevered oak staircase is the focal point of this central space and is conceived as a play of light and shadows, offering glimpses through the open risers to the sunken living area and rear garden beyond. 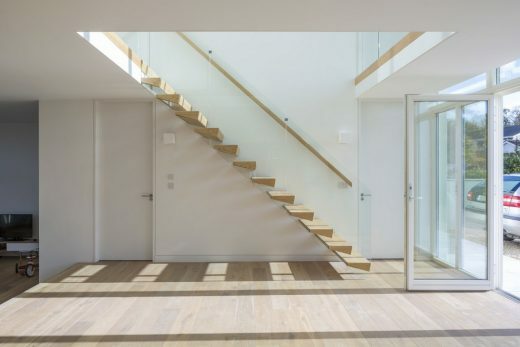 To the left of this entrance, is a light-filled kitchen and dining space that opens onto a secluded side patio, designed for summer dining, with raised flowerbeds and the shade of a large cherry tree. 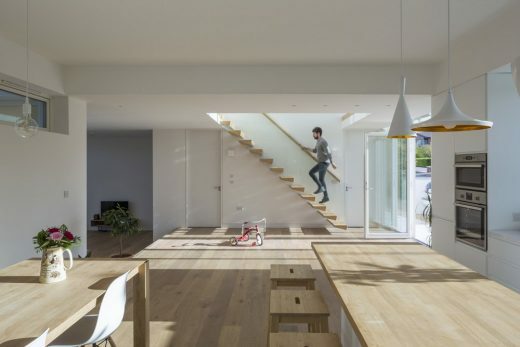 To the rear of the house is a split-level garden designed to borrow views of the surrounding trees and plants while maintaining a terraced area for relaxation in the summer. 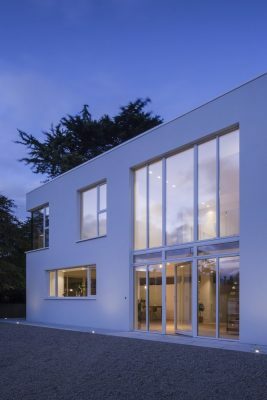 The careful landscaping of the gardens seeks to connect the interiors with the surrounding greenery while also enhancing the sense of seclusion within the living spaces. 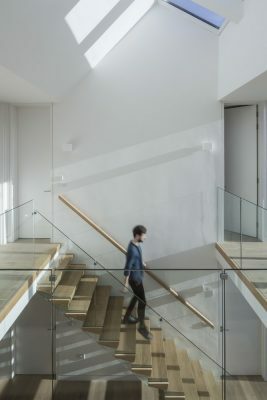 Stepping back into the house, down through the cosy sunken living area, the glazed balustrades of the open stairwell reflect views of the garden and sky. 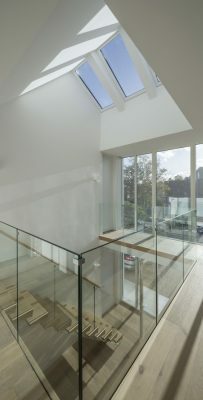 The central atrium connects all four bedrooms at first floor level around light-filled library space. 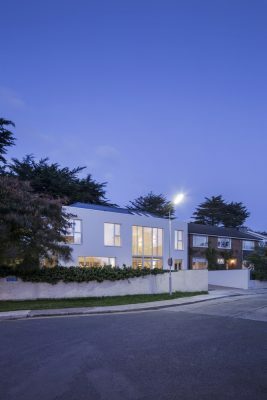 The bedrooms look out via the large frame-less corner windows, through the surrounding trees to glimpses of Dublin Bay beyond. 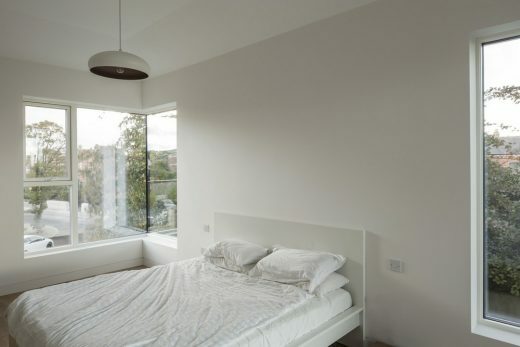 The generous pitched ceiling to the master bedroom creates a special space of repose within the dwelling. 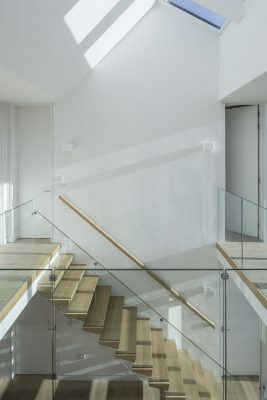 The dressing rooms and en suite leading directly from the central library space act as an antechamber to help enhance this sense of retreat. 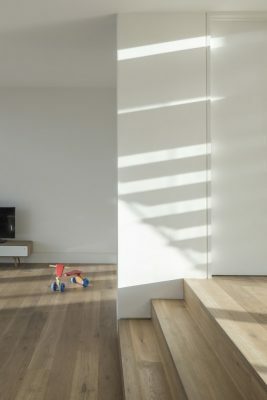 The simple aesthetic of white walls and oak flooring offers a backdrop to the play of light throughout the house while also representing an honest minimalism that is a combination of the Client’s desired aesthetic and the financial constraints involved. 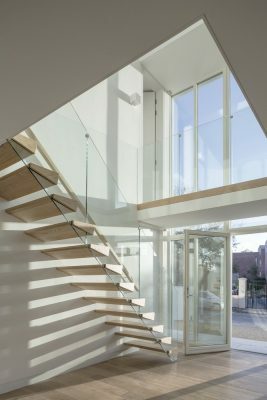 The construction is a predominately concrete masonry and steel structure. 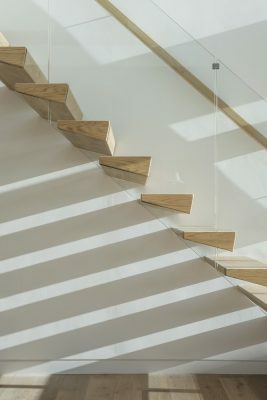 The engineering required in achieving the thin library floor and cantilevered stairs was challenging, and the structural engineer and stair fabricator worked collaboratively to help us achieve this. 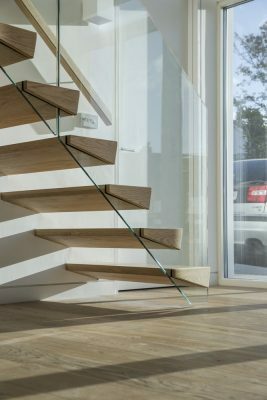 All the timber used in the project is a white-oiled oak with aluminium-framed timber glazing used for the windows. 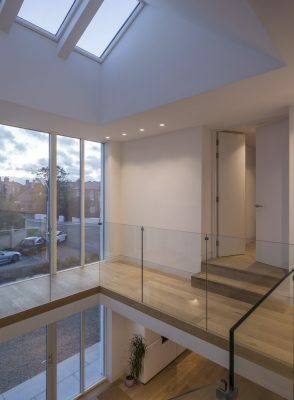 The large south-facing, triple glazed atrium combined with an air-to-air heat pump and mechanical heat recovery ventilation, not to mention external insulation and underfloor heating, help to create a very energy efficient home with a BER rating of A2. 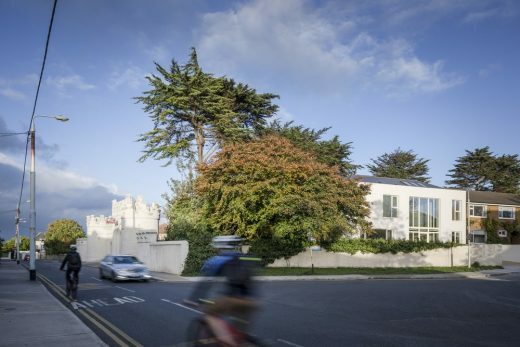 Villa 9010 successfully places the house within the wider context of this coastal village, connecting the family to the landscape and sky and creating a sense of intimacy within the site while also borrowing from the grandeur of the adjacent school gates to create an internal spatial monumentality.